Align by Design - Smart Solutions for Dumb Buildings! 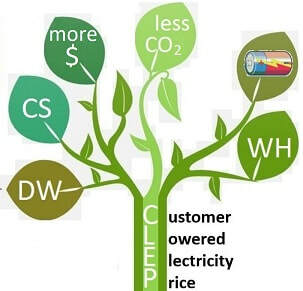 Benefit all consumers, even non-CLEP customers. ​Because CLEP provides short payback periods for thermal and electric storage investments and makes many of them cost-effective for the first time, CLEP greatly improves electricity reliability in the face of Entergy New Orleans’ thousands of power outages a year. Because CLEP flattens peak demand at negative costs to all ratepayers, CLEP completely shields users from extraordinarily high-priced electricity and plans to build, NOPS, a $200 million peaking plant. Come find out about this revolution in electricity pricing! ​in order to use the CLEP "dashboard" application to get a Hands-On Experience as a Virtual CLEP customer. The current version demonstrates that CLEP pays for Community Solar at 13% higher than retail! Watch the video of the full, 4-hour, Align by Design session recorded on 24 Feb 2019. ​Corrected Speaker's Notes for each talk are available here.